Dear player. in this meta we have added many Spring Festival elements to the game. Also. the all new “Conquest of Dawn”is open, which provides an arena where all players can fight in the name of their regions. And more new modes will be available. Have fun! 1. New hero – [Tribal warrior] Badang .Diamond 599, BP 32000, Launch week 30% diamond OFF. Available from January 15th (Server Time). Free access to heroes becomes unavailable when they’ re out in the Official Server. 3. Selena new skin [Virus] : Diamond 899. Limited 30% OFF from 0:00 Jan. 18th to 0:00 Feb 1st (Server Time). 4. 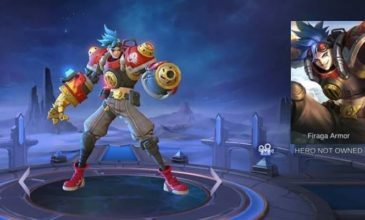 Selena new skin [Virus] will be in a bundle. Limited 30% OFF from 0:00 Jan. 18th to 0:00 Feb 1st (Server Time). 5. Aurora new skin [Aquarius] – Obtain by Zodiac Summon. 7. Lunox and her skin will be In a bundle Launch week 30% diamonds OFF Available from 00: 00 January 22nd (Server Time). 8. Saber skin [Force warrior] has been revamped! 9.Adjustments in goods in Fragment Shop on Jan.
A. Premium Skin Fragment Shop: [Moskov] Yasha Available. 11.hop-Skins-Sacred Statue: Added Miya [Moonlight arrow] Use twilight coin to exchange. Chieftain’s Rage: Now use this skill in the two-sword state to get a damage takenreducing effect. Brave Stance: Optmized the display effect of speeding up. Adjusted Basic HP to 2570 from 2670. Fixed a problem where her energy regen will be effected when obtaining healing bonus, healing reducing effect. shield bonus and shield reducing effect. Love Waves: Fixed the wrong skill info. Fixed a problem where his energy regen will be effected when obtaining healing bonus. healing reducing effect, shield bonus and shield reducing effect. Pursuit: Fixed the wrong display range of the skill. Contract: Soul Steal: Fixed a problem where the basic attack can‘t be used to the target who is in the special state. Master of Camouflage Fixed a problem where the CD of the skill upgrades wrongly when interrupted in some conditions. Adjusted Basic Physical Defense to 21 from 25. Fixed a problem where her energy regen will be effected when obtaining healing bonus. healing reducing effect. shield bonus and shield reducing effect. Fixed a problem where his rage regen will be effected when obtaining healing bonus, healing reducing effect. shield bonus and shield reducing effect. Fixed a problem where his energy regen will be effected when obtaining healing bonus, healing reducing effect, shield bonus and shield reducing effect. Fist crack : Adjusted Base Damage of explosion to 60/78/96 from 96/120/144. Adjusted Physical Bonus to 0.3 from 0.4. Optimized display effect in battlefields. Tyrant’s Revenge: Adjusted Base Damage to 80/110/140/170/200/230 from 50/80/110/140/170/200. Tyrant’s Rage: Fixed a problem where the skill will wrongly stun enemies. Vicious Retrieval: Instead of shooting out bullets, now each soul Faramis retrieves will reduce respawn time. Shadow stampede : Now faramis will regen HP when pulling enemies back to himself. 2.Fixed a problem where the gold-gaining skills lose effects. 3.Added notification for using Battle Emote. 4.Now the Neighbourhood leaderboards rank will be shown first when having mastery code badges. 1.0ptimized the animation effects of Core Guard and Statued Shocker when they leave health packs. 1.0ptimized the energy regen or rage regen problems of the following heroes: Fanny, Minotaur. Hayabusa. Argus. Lesley. A. Optimized display difference to equipment items and skills. B. Added visual display of picking up equipment items and skills. C. Added visual display when interrupted while rescuing or healing. D. Optimized the display of Rescue and Request for Help Buttons. E. Optimized the display of recommended items. F. Optimized the new sound effects of picking up equipment items and skills. A. Each player can claim 1 Chocolate in the event page and claim 4 via battles. Players may also share the event and complete limited event to claim 1 Chocolate. Chocolate can be used to interact with friends in the Event Page or in Private Chat during the event. Unused Chocolate will be cleared each day at 05:00 AM (Server Time). B. Each player can send requests to friends 10 times each day. However, for the same friend, a player can request once each day. C. Should a friend send request to you, you can treat them through the shortcut in the Event Page or in Private Chat. D. After receiving a warmly treat from your friends, you can claim the Valentine Gift in Event Page or in Private Chat. The gift guarantees a random reward from the following list: Tickets, Emblems, Fragments. Trial Cards and Permanent Skins. E. Try to send as much Chocolate as you can! Once you send 35 chocolate or more, you will receive a permanent copy of a Limited Valentine avatar border! F. When the event is over, the items will be recycled automatically and several BP will be sent to you. 1. Rank : Added new matching display for players of Mythic and above. Adjusted the respawn time to 10s. Fixed the logic of the fourth task Gatotkaca. Adjusted the difficulty of some tasks. Added the mastery tasks for Badang and Vale. 4.Optimized the speed and animation of Settings. 5.0ptimized the interface in Leaderboards. 6.0ptimized the “Enter” button when successfully matching up; Now it will show in Iow-quality display. 1.Fixed a problem where some players may fail to share reports to FB/VK. 3.0ptimized the display of Social interface. 4.Fixed a problem where some heroes may lose their voiceovers. hi anong Oras po ba itong bagong update?? ?